Politics professor Jytte Klausen has spent a decade mapping the Western jihadist’s journey from homegrown extremist to foreign fighter. Right after the Jan. 7 terrorist attack on the French satirical magazine Charlie Hebdo, Jytte Klausen’s phone started ringing off the hook. Reporters wanted to know why Muslim extremists were fixated on the magazine’s satirical cartoons depicting the Prophet Mohammed. And were Saïd and Chérif Kouachi, the French-born Algerian brothers who stormed the Charlie Hebdo office to gun down 12 people, including a police officer outside, the face of a growing jihadist threat in Western Europe? Klausen, the Lawrence A. Wien Professor of International Cooperation, is one of only a handful of scholars tracking the development and spread of networks of “homegrown” jihadists raised in the West. Radicalized at a young age, many of these jihadists seek to join the insurgency in Syria or Iraq. Some may engage in a jihadist fight in Europe, as the Kouachi brothers did when they mounted France’s worst terror attack in decades. Klausen’s commentary has appeared in media outlets like Foreign Affairs, Time and NPR. She’s advised the U.S. Department of Justice (DOJ); counseled the Joint Chiefs of Staff on developing U.S. strategy to combat the terrorist group Islamic State, known as ISIS; and helped establish an interfaith dialogue in Germany to better integrate Muslims into that country’s society. After 9/11, the Danish-born political scientist with a longtime interest in European social movements began studying Muslim integration in Europe. At the time, the notion of a “clash of civilizations” between religious Muslims and secular Europeans was gaining currency. Klausen decided to investigate, interviewing hundreds of Muslim leaders in six European countries about their religious and political views. “The Islamic Challenge: Politics and Religion in Western Europe,” published in 2005, grew out of that research. Klausen calls it her “good news” book because her findings refuted the “clash of civilizations” claim. Muslim immigrants in Europe, she says, seek what all other Europeans want: jobs, education, prosperity, and a better life for their children. Religion is secondary to these aspirations. While researching mainstream European Muslims, Klausen also became interested in the Muslim fringes, where extremist ideology was gaining traction. With initial funding from the U.K. Home Office and later with DOJ support, she started tracking the growth of Western jihadist networks. 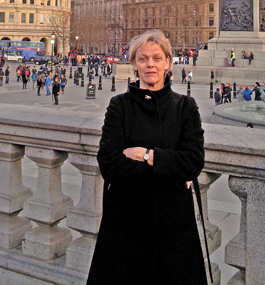 Klausen created the Western Jihadism Project in 2006 with research assistance from a committed group of students who, like her, believed the world had fundamentally changed after 9/11. It was the first time anyone had taken a highly systematic, transnational approach to identifying, analyzing and coding jihadist networks across Western Europe using public sources, including court records and social-media accounts like Twitter, YouTube and Facebook. Over the past decade, the Western Jihadism Project has become a go-to resource for data on the spread of al-Qaida-inspired jihadist and extremist Islamist ideology in Europe. In a colorless office on the edge of the Brandeis campus, behind locked doors (to protect computer data), Klausen and her team of approximately a dozen students collect, interpret and archive data, translating more than a dozen languages. 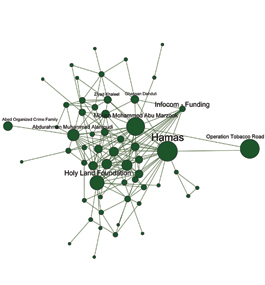 They then use statistical analysis to diagram an intricate network of homegrown jihadists. Klausen’s project has produced a database of information about 3,500 Western citizens convicted of crimes directed by al-Qaida and related extremist organizations. In addition, Aaron Zelin ’10, a former Klausen student who’s now a PhD candidate at King’s College London, has created Jihadology.net, a highly regarded website for Sunni jihadi primary-source material. The year before Klausen launched the Western Jihadism Project, a Danish newspaper published 12 cartoons of the Prophet Mohammed. Five months later, Muslims around the world rose up in protest over the satirical images, handing Klausen her next book topic: Was the belated furor over the cartoons religious, cultural or political in nature? “The Cartoons That Shook the World” (2009) became a cause célèbre of its own when Yale University Press refused to reprint the offending cartoons — or any other historical or artistic depictions of the prophet. Klausen decried Yale’s decision but agreed to go ahead with publication. Today, the book is considered the definitive account of the Danish cartoon controversy, which Klausen concludes was rooted in politics, not religion. Klausen is currently wrapping up her latest book, provisionally titled “Democracy Is Forbidden,” due out next year. The book explores the core doctrine of jihadist thinking, a bin Laden-inspired comprehensive ideological program exploiting Western technologies and globalization for its own benefit. On sabbatical this spring to finish the book, Klausen sat down with Brandeis Magazine to discuss her research. Are we seeing a rise in homegrown Western jihadism? Absolutely. My research shows that about one in three fighters will return to the West from Iraq and Syria to carry out violence of one kind or another, though not necessarily successfully. Interpol recently announced there are 150-250 armed, ready and dangerous terrorists on the ground in Europe. That’s the largest number we have ever seen. If you think jihadism is from “over there,” you will never overcome it. 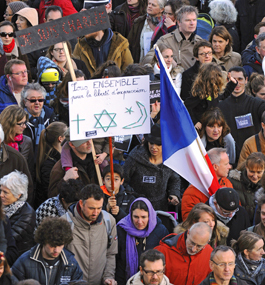 What’s the biggest impact so far of the attack on Charlie Hebdo? We’re seeing massive arrests and big anti-terrorism legislation packages coming through in several European countries. The U.S. government is going after Internet providers and the companies that encrypt their communications, as well as urging them to exchange information about online threats. The “Wild West” days of the Internet are definitely over. Has the attack had any effect on public attitudes toward free speech? You’ve said that we should “protect the speech, police the threat.” How do we do that? I can see the contradiction inherent in that phrase. But even American constitutional doctrine says that free speech is not an absolute value. You don’t have freedom to libel people, for example. Incitement to violence is not protected speech if there is an imminent threat of violent action. And I don’t see why there should be the same degree of privacy on the Internet as with person-to-person contact by phone or mail. These are public postings on public sites like YouTube and Facebook. You cannot write a letter to a newspaper without providing your address; why should you be able to do that on a public Internet site? What have you learned about homegrown fighters through their tweets, posts, blogs and videos? Until recently, posting extremist messages online carried few consequences, and users would freely share pictures of themselves and indicate their peer networks. So, very often we know who they are, and even if we don’t learn exactly who they are, we learn where they come from, how they developed their attitudes, what attracts them to these new ideologies and what the properties of their belief system are. How are social media changing the way that jihadists are radicalized? Social media have freed the jihadist movement from the geographical constraints that used to hamper it. If you wanted to go abroad to fight, you had to know somebody who knew somebody. Today, you make contact online through Twitter or Facebook, and then use an encryption site to speak directly. There is even a romantic element to the way social media create virtual transnational identity communities. People get “married” online to romantic avatars of jihadist warriors and princesses, and they actually create profiles calling themselves “jihadi princess” and the like. How do extremist groups exploit social media? Jihadist groups have been extraordinarily efficient in translating this opportunity into operational tactics, setting in motion recruitment drives and emigration. They’ve been successful at translating extremist ideology into short key points — identities that local immigrants can quickly embrace without knowing Arabic, or really knowing anything about Islam at all. Social media are able to draw people into an alternative mindset that separates them from parents and friends, and into a completely sectarian lifestyle. What is the lure of the jihadist lifestyle? Young people get fired up by a sense of mission and excitement, even though their understanding of Islam is very superficial. They see themselves as heroes of their own story, and that kind of romantic mythmaking, along with an über-masculinization of the jihadist lifestyle, plays a huge role in attracting new fighters. That message seems to appeal to young Muslim women in Europe as well. Yes, the threshold to becoming involved has lowered to the point where very young, inexperienced Muslim women are joining the jihadist movement as high-status wives of fighters or even as fighters themselves. Usually, these young women meet somebody online or through a local youth group. Initially, their parents see it as a good thing when their daughter starts wearing a headscarf and becoming more religious; they think she has found religion. Now she’s not hanging around with those scary girls who might get her into drugs and alcohol; now she’s studying the Quran. Only later do they realize that, as this is happening, their daughter is being taken from them. Do most fighters come from the socioeconomic margins? Most of the time, the Western recruits are not poorly educated, and they’re marginalized more or less by choice. Many of the current cohort of Western jihadists are college-educated and have done well in school. Alienation doesn’t drive ideology; ideology drives alienation. They drop out of school because they become radicals, not the other way around. There are exceptions, though. Sometimes socioeconomic factors do play a part. Economic growth has been slow for a long time in France, and it has been difficult for young people in France — and elsewhere in Europe and the U.S. — to move from marginal employment, like pizza delivery, to regular jobs. There are some intangible obstacles. But it’s wrong to say that they have been thrown out of society. That’s just not the case. How long is the radicalization process? We don’t know how long it takes for a young person to segue from “Hey, this is cool” to “I now want to go and fight.” Some anecdotal evidence suggests it may take six months, while other cases suggest it may take a year or longer. But, particularly where very young people are concerned, it can look like a startling shift to parents, peer groups, friends — this shift from a normal life to a new militant peer group, which is located partly online and partly in a social reality over there. Aren’t Western fighters usually given the most dangerous assignments, including suicide missions? Some Westerners have risen to high positions within terrorist organizations. It’s difficult to say whether they are also singled out for more menial tasks or suicide missions. Whatever the reason may be, more of them are dying. I thought the increased casualty rate among Western jihadists — anywhere from about a quarter to a third of them appear to have died thus far — would deter recruitment, but that hasn’t been the case. And observers are scratching their heads about that. Of course, young people don’t have a sense of their own mortality, and the movement really values death. They are indoctrinated into completely magical thinking about what it means to die. Sometimes they believe that they won’t even feel pain, and that the minute they are separated from their body, their soul will rise. They have a completely unrealistic understanding of what they are getting into. How should governments treat returning fighters? There’s a big debate about this. You can’t de-radicalize somebody who doesn’t want to be de-radicalized. We know that second thoughts and regrets are very rare, and recidivism is much higher among jihadists than it is among ordinary criminals. If you try to rehabilitate former jihadists, you have to go light on the criminalization, on punishment. Some of the young women are abused, and they should be treated as victims. But I’m very reluctant to declare all these homegrown fighters victims. Many of them have committed crimes against Syrian and Iraqi civilians, and should be prosecuted for their crimes. They have participated in executions, and engaged in fighting that has deliberately targeted civilians, religious minorities and cities. Some are long-term members of the extremist networks and veterans of previous insurgencies. Liberal democratic societies have a right and an obligation to defend themselves. We do that within the bounds of the law, but a tough response is required. The key principle here is that to be free, you have to be secure. This is a tough balancing act, but something we have to think about carefully in the context of fighting violent extremism.